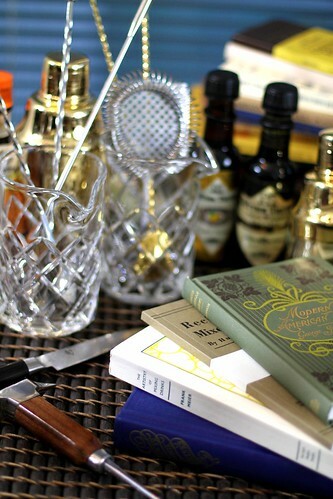 To continue with the holiday shopping theme of late, here are a couple of suggestions for the cocktailian in your life that has everything. First off, why not get them a bottle of tequila that they’re sure not to open: one of 1800’s beautiful artist designed bottles? I wrote about this last year, and it remains at the top of my list for cheap booze art (and you can drink it if times get rough!) as this year it’s running for around $25. While I’ve mentioned this next spot for cocktail tools many times before, it bears repeating (I still get emails asking where to go for quality equipment), as it is ever evolving and expanding: Cocktail Kingdom. This is the go to site for quality tools and supplies. Almost all of the bar tools that I currently use come from this site, and while some of the tools may be pricy, they should last you a lifetime. Whether you are looking for a lipped mixing glass, gold (workable!) cobbler shakers, beautiful Japanese spoons, hard to get bitters, exquisite reproductions of out of print cocktail books, ice picks, jiggers, strainers or bitter bottles this should always be your first stop. Make sure to check out the site often, as new equipment is always arriving. I’ve said it before, and I’ll say it again: thank God for Greg Boehm! Stay tuned for more spirit reviews and recipes! Recently I’d received a bottle of Xanté from a PR firm, and while it wasn’t in quite the seductive packaging that my fellow writer Jeffrey received his in, I found it worthy of mentioning, which brings me to the keyboard this evening. A luscious copper hue, I opened the bottle expecting to find a sample of the usual run-of-the-mill liqueurs that habitually grace my door unannounced. While the bottle was beautiful, and the literature described the product as an exhilarating liqueur combining the sweetness of virgin pears and soft scent of vanilla with a touch of the finest French Cognac, it has been my experience that most liqueurs that surprise me at my doorstep are there because no one else will have them and as such I have long ago stopped bringing in those strays (thank you Pumpkin Spice liqueur for eating my books, defiling my floor and then breaking out through the screen door before I even knew what hit me). Despite my better judgment, and perhaps because of the fine packaging, I decided to go beyond the usual cursory glance and sniff and decided to give this product a taste. Starting with aroma, Xanté’s nose is one that screams ripe pear just plucked off the tree. Behind this, one gets slight vanilla and caramel spice. The palate echoes that, with the Xmas spice being a touch more pronounced. While this is a liqueur, it’s not overly sweet and possesses good body, backed by the cognac at a healthy 38% alcohol. It immediately made me think of fall, and of course cocktails. 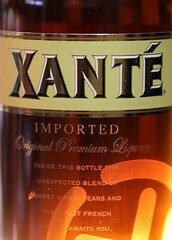 The Xanté shows through brilliantly, tempered by the spice and bitterness of the Angostura. The lemon twist, while just garnish, is necessary in brightening up the whole concoction with its essential oils. This one is a keeper, and has me excited about experimenting more with this product, and at a $40 SRP (it can be found for much cheaper), it wouldn’t make a bad Xmas gift for that cocktailian on your list either. This highly praised, award-winning single malt is matured in American and European Oak refill casks and is an extremely limited release. This single malt whisky is vatted from a mixture of American Oak and European Oak refill casks. This 30-Year-Old malt is indisputably from the makers of Brora whisky, yet in an attractive, softer guise. This rare edition natural cask strength single malt is the fourth limited release of unpeated Caol Ila whisky but the first that’s been aged for ten years. Caol Ila Unpeated 10-Year-Old whisky is made from a batch produced only once a year from unpeated single malt. This limited edition is the eighth of a series of special 12-year-old releases from the original distiller’s stocks. Lagavulin 12-Year-Old is a natural cask strength single malt whisky vatted from refill American Oak casks. This whisky is a limited edition natural cask strength single malt, the ninth of a very rare series. Annual allocation of Port Ellen ensures availability of this irreplaceable malt for just a little longer. This single malt is one of the last remaining traditional distilleries where the whisky is entirely handcrafted. Not typically sold in the US, Royal Lochnagar Selected Reserve is an extraordinary find. Talisker The Distillers Edition is the first of its kind to be released in the US since 1994 and is double-matured in Amoroso Sherry casks. Oban whisky is made using only the finest barley, malted to the distillery’s own particular specification. This single malt was double-matured in Montilla Fino wood, giving it a fruit-tinged elegance. Lagavulin The Distillers Edition was double-matured in Pedro Ximenez Sherry wood casks. This whisky is a distinctive and distinguished dram, delicately balanced by the grape flavors from the Sherry wood. This single malt is an extraordinarily stylish and complex double-matured expression of Caol Ila whisky. The Moscatel cask wood is not over-evident but richly flavored yet also finely balanced. Dalwhinnie The Distillers Edition was double-matured in Oloroso Sherry casks, giving it a rich and spicy nose with a dry and oaky finish. While I normally don’t blog about my media attention or accolades, this one is just too cool not to mention. Food, Fashion, Drink and Style, these themes have been the focus of entire cable networks, online hubs, mobile channels, and blockbuster films. They’ve launched chefs, restaurants, designers, celebrities, vacation spots, hotels, wineries, events and products … sometimes all at the same time. They’ve entertained us at home and on the job, and helped us aspire to make our lives more enjoyable and fulfilling. 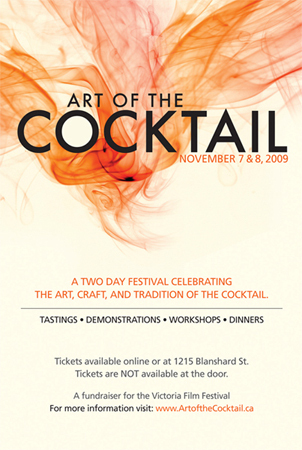 The Tasty Awards were originally conceived and announced in 2008 as part of the first New Media Tastemakers Summit in San Francisco. The goal was to recognize and acknowledge outstanding excellence in video content focused on food, drink, fashion and design. These beloved categories dominate a large portion of video / television viewership – as well as advertising spending and sponsorships — and yet they do not have their own awards for achievement . Until now. Hosted by food and travel television star Zane Lamprey of “Three Sheets” fame (FLN), the show features a star-studded lineup of food and fashion TV celebrities, including Tyler Florence (Food Network), Joanne Weir (PBS), G. Garvin (TV One), Tanya Holland (Food Network), Leslie Sbrocco (PBS), Gary Vaynerchuk (Wine Library TV), Marcy Smothers (Radio), Novella Carpenter (Author), Anita Chu (Author), Dominique Crenn (Food Network – Next Iron Chef)), Brian Solis (New Media Guru), Marissa Churchill (Bravo, Top Chef), and more. After years of planning, we present to you the Tasty Awards for outstanding food & fashion programs on television, in film, and online. It appears that Raising the Bar is a finalist in the categories for Best Drink or Beverage Program-Web and Best Single Topic Series. 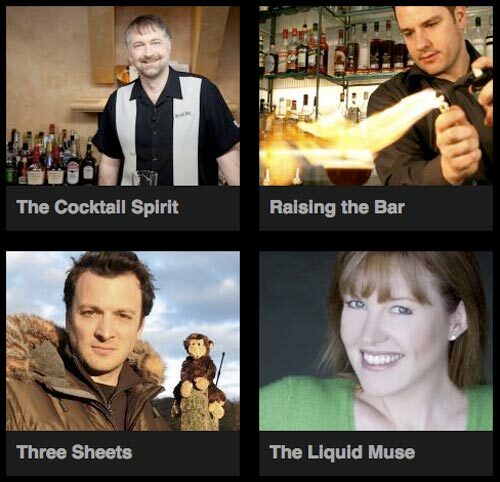 Mr. Hess and Natalie Bovis-Nelson (Inspired Sips) are also up for awards, making every cocktail oriented program on the Small Screen Network a finalist for this event! Here’s hoping that they seat me in between Anthony Bourdain and Meryl Streep! I’ve always said that Salvatore Calabrese couldn’t mix a drink to save his life! Seriously though, this is pretty fun to watch: it should be a ride for bartenders at Disneyland, or used as a learning tool for how long and hard to shake Ramos gin fizzes. the art, craft, and tradition of the cocktail. The Art of the Cocktail opens the door to a world of elegant spirits: great classics, the fresh trend, the established players, niche bitters and the artisan, small, regional distillers. Seasonal. Gourmet. Micro. These are all words that apply to making sophisticated culinary cocktails. True mixologists worry about the shape and size of ice, the quality of their bitters and finding the perfect balance of flavours. They tinker with dehydrators to crisp garnishes, smokers to lend complexity, flavour syrups, and these masters of the bar whip up fresh fruit purees, house made grenadine and raid the kitchen for exotic ingredients. The Slow Food movement has invaded cocktail hour. Modern, elegant, expertly crafted and above all thoughtful are the styles that have come to define the best cocktails. Learn the alchemy of how to make and appreciate a proper cocktails. 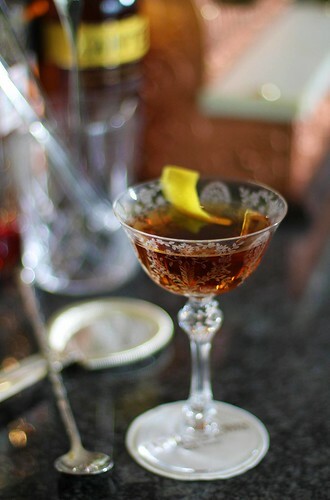 And then one day, with a little luck, you’ll be able to order or create a perfectly crafted Manhattan, Sazerac or Sidecar. This month our theme is the Old Fashioned, an august cocktail consisting of spirit, sugar, water and bitters, a very simple concoction which can pose a problem when trying to deconstruct into a “drink” made into molecular mixology’s style. As cherries are often added to the old fashioned as a garnish I thought that it would be a fun idea to turn the cherry itself into the drink. This was accomplished by first pitting the cherries and then carving out the hole to make a goodly portion of the cherry hollow. When one is doing this, you want to leave the top of the cherry and the stem intact, as will be discussed later. Next, one wants to take an Old Fashioned and mix it with the ingredients that you bought for last month’s recipe, the Caipiroli. This will allow some of the mixture to form a “skin” while most of it remains liquid. As you fill your hollowed cherries with the alginate mixture you want to insert them upside down into the chloride bath so that all of the mixture stays inside the cherry, but a skin will form along the bottom of the cherry, sealing the liquid inside. Filling the cherries in this manner will make them appear untouched when you place them stem-side up, thus completing the illusion that the guest is just eating a normal cherry. 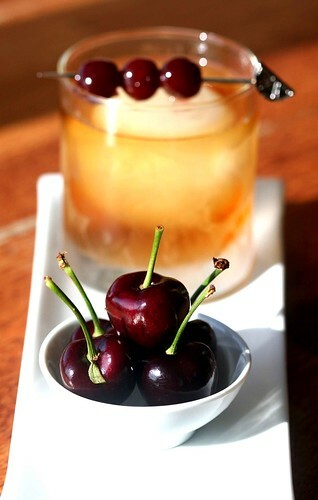 When serving this drink, place several Cherry Old Fashioneds into a small dish and serve alongside a real Old Fashioned. This way you guest can alternate between eating the Old Fashioned and drinking it all the while noting how the texture plays a role in the flavour profile and how well the cherry works with the rye and bitters. I hope you’ve enjoyed this fun twist on this venerable cocktail. Until next time!